The computer peripheral lighting craze hit full steam this past year, with countless manufacturers releasing RGB peripherals designed to give users more customization options for their workstations. For years, peripherals like mice and keyboards have had RGB lighting implemented, but this year we saw the RGB craze extend into products like speakers, headset stands and mouse pads. Yes, you read that right, this year has seen several major manufacturers release RGB mouse pads. 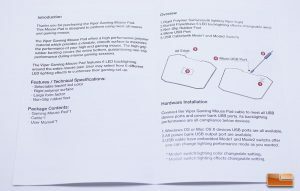 Today, we are looking at the latest entry into the LED backlit mouse pad arena, from California-based computer memory and peripheral manufacturer Patriot, the simply-named Viper Gaming LED Mouse Pad. If you think the prospect of an LED mouse pad is silly, I don’t blame you, but there is a market for these products. Manufacturers have taken PC customization to insane levels and enthusiasts want to match their computer aesthetic as much as possible. There is an undeniable cool-factor that comes with coordinating the lighting on your PC peripherals and the ability to customize the aesthetic of your workstation has never been something to frown upon. I’ve said it countless times, as silly as products may seem to some, having abundant choices and competition in the PC arena is excellent for consumers. While many of the LED mouse pads on the market connect to your PC and use software suites to control the lighting, the Viper Gaming LED Mouse Pad lighting control works independently of the PC, using a USB control box and connection that is only for power. You can even connect the Viper Gaming LED Mouse Pad to a wall adapter or other USB power source to help optimize cable routing. Unfortunately, due to not having control software, the Viper Gaming LED Mouse Pad is fairly limited in its lighting modes and doesn’t have the zone customization functionality seen with Corsair and Razer RGB LED mouse pads. With the Viper Gaming LED Mouse Pad, you get a beautiful mix of rainbow effects and the ability to set individual colors, but there is no actual RGB to be controlled here, what you see is what you get. 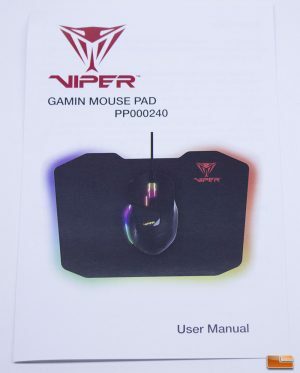 An advertised feature of the Viper Gaming LED Mouse Pad is that unlike offerings from Razer and Corsair, the top portion of the mouse pad doesn’t have a large control box attached to it, which will allow for more uninhibited mouse movement, since your mouse cable won’t be running into a large piece of plastic constantly. It is good to see that Patriot is covering the Viper Gaming LED Mouse Pad with a 2-Year warranty. 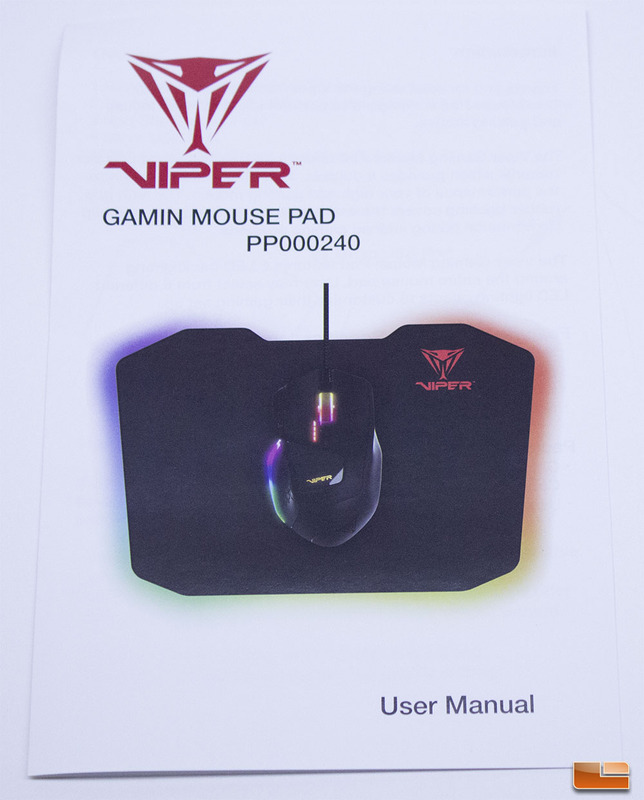 The Viper Gaming LED Mouse Pad features a polymer surface and it has been my experience that hard surface mouse pads tend to lose the texture on their surface and develop shine over time. It would really give users a bad feeling to drop a lot of money for a mouse pad to have it wear out, so a solid warranty is reassuring. 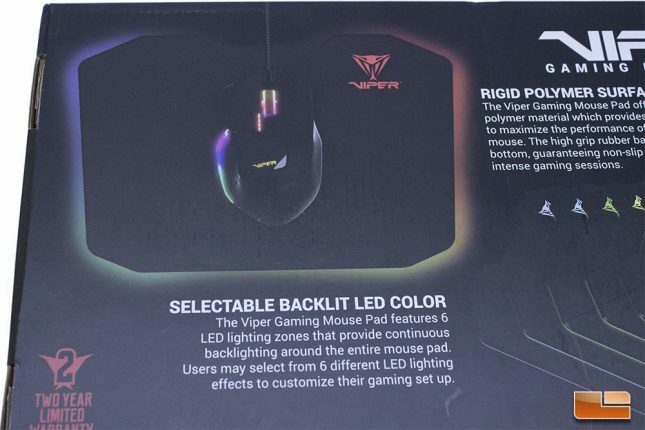 While LED technology is amazing, I’ve personally experienced enough issues with LED lights that died or decided to flicker on my peripherals to know that they aren’t perfect, so its good to have a two year warranty to cover your lighting, which is the reason you’d get this mouse pad in the first place. We are talking about a $59.99 mouse pad in the Viper Gaming LED, so warranty considerations aren’t so crazy. Patriot ships the Viper Gaming LED Mouse Pad (PN PV160UXK) in a black box with appropriate pictures and text across the front and rear of the box. The box is adequate, but it doesn’t have the high end feel or materials I’ve been seeing from other manufacturers as of late, with a thin, easy to tear cardboard being used. Viper did a good enough job with the print, putting glossy images over a matte background, but the packaging doesn’t evoke a premium feel. 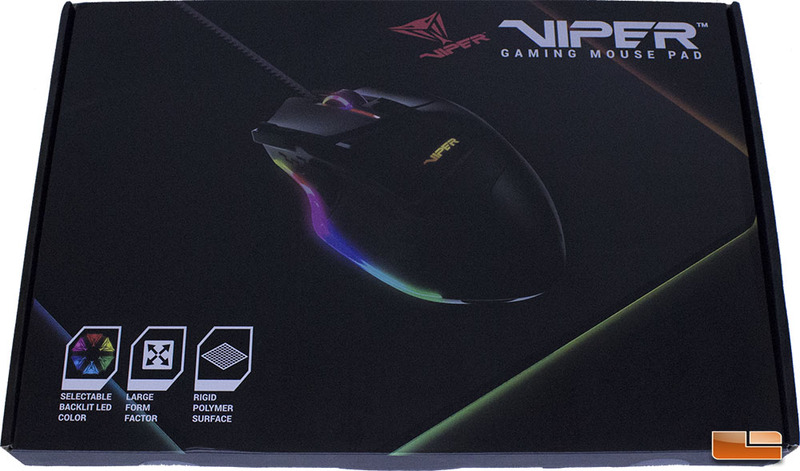 On the front of the box, Viper has placed their V570 Blackout RGB Gaming Mouse ($59.99 shipped), which we will be reviewing very soon. 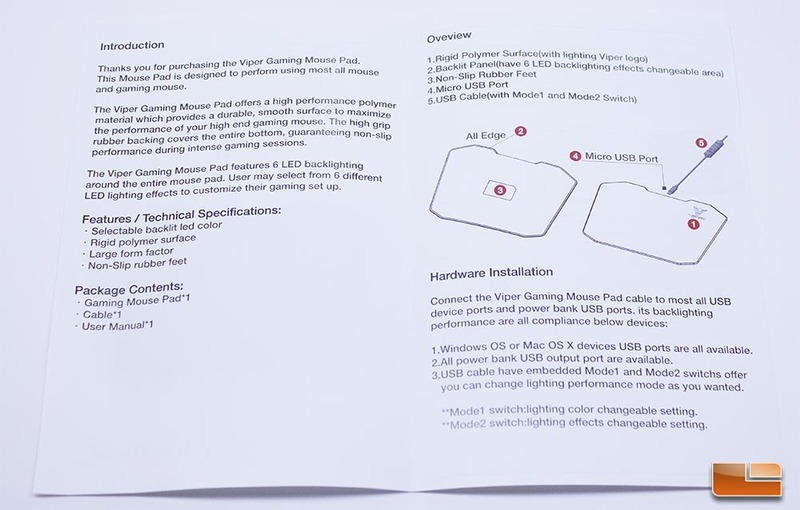 There is an instruction manual included with the Viper Gaming LED Mouse Pad. Note that the product name has been misspelled on the front of the manual. The manual is pretty basic, but it does explain how to adjust lighting by using the two buttons on the USB cable control box that is included with the mouse pad. While the Viper Gaming LED Mouse Pad ships in an adequate box with clear branding, if Viper wants to appeal to PC gamers who are going to see this product on the shelves at Fry’s next to other brands who take care to package their products with excellent materials and branding, they are going to want to step up their packaging game.